Making Vietnamese food is simple. 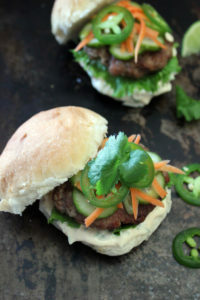 Follow along to learn how to make these delicious Banh Mi Sliders. Vietnamese food is relatively easy to make as long as you have the ingredients on hand. Some of these ingredients are sesame oil (also use in stir-fries), rice wine vinegar (make salad dressings), and fish sauce (good in stir-fries, dips, soups). It’s probable you may only find larger bottles but will most likely use them again. Vietnamese cooks use a lot of fresh ingredients like tamarind, lime, chiles, green mango, lotus stems and pungent herbs. Find and using fresh herbs (cilantro) in this recipe is key to making this flavour packed meal. Make the patties bigger if you prefer manly sized burgers vs sliders. You should get 6-8 burgers out of this recipe. If you are short on time, don’t worry about pickling the vegetables for this burger. Fresh sliced cucumbers and peeled carrots work just fine. Sriracha mayo is spicy. Cut back on the sriracha if you don’t like the heat. Or add more if you like it spicy. Skip the bun and use a lettuce leaf as a cup. Remember burgers can shrink slightly so making them a little bigger is a good thing. If you do not eat pork try substituting lamb or beef. The flavours in the burger stand out so much I had to convince my 8 year old to not add any ketchup to the burger. He did add a little plain mayo and after a few bites he agreed. Then he proceeded to eat 3 sliders for dinner. Like the flavours in this recipe?! Check out these recipes using fish sauce and pork. Quick Pickles: In a bowl or small jar mix together sugar and 1 cup rice wine vinegar, stirring until the sugar is dissolved. Add the carrot strips, cucumbers and scallions. Set aside in refrigerator until ready to use. Place the pork in a mixing bowl and add in sesame oil, ginger, garlic, 2 tsp rice wine vinegar, fish sauce, brown sugar and a pinch of salt and pepper. 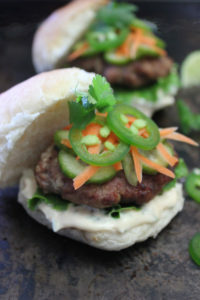 Divide the meat into 10 equal parts, and form each part into a slider. Grill the burgers until the meat is no longer pink inside about 4-5 minutes per side. Assemble: On a bun slather on some sriracha mayo if using, add your burger, a piece of lettuce and about 1/4 cup of the drained pickle mixture onto the burger. Sprinkle with fresh cilantro and thinly sliced jalapeno peppers. 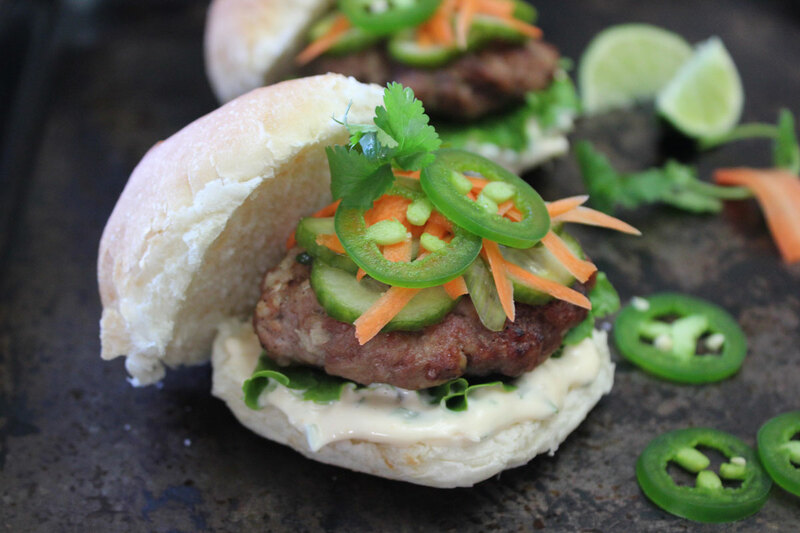 To make sriarcha mayo mix together 1/2 cup mayo, 1 thinly sliced scallion, 1-2 tbsp chopped fresh cilantro, 1.5 tsp sriracha (or to taste), pinch of salt, zest and juice of of half a lime. Store in refrigerator until ready to use. Mmmm, those look very good! !